All reviews and gossip indicates that the new Paddington Bear film is not just for children and is adult friendly. 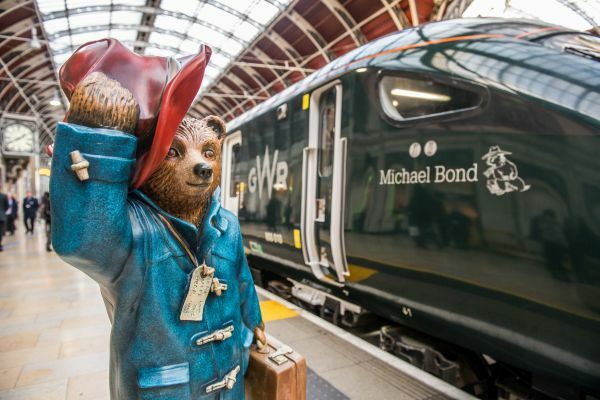 And to back it up Great Western Railway (GWR) has named one of the first of its new Intercity Express Trains after novelist Michael Bond who died last year at the age of 91. The train, 800010, was unveiled by his daughter Karen Jankel at a special event on Platform 1, London Paddington, near to where Paddington first comes into scene in the 2014 film of the author’s famous creation. Michael Bond created the character Paddington based on a small bear he saw sitting all alone on a shelf in a London department store near Paddington Station on Christmas Eve 1956. Released on 13 October 1958 since then more than 35 million Paddington books have been sold around the world. The characters have also been featured on television and in two feature films.